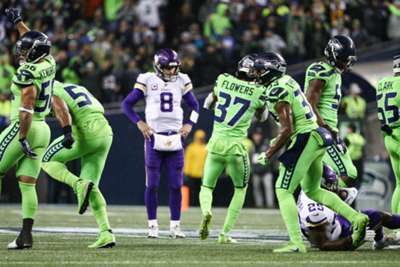 The Seattle Seahawks moved to the brink of the NFL playoffs after dominating the Minnesota Vikings 21-7. Seattle produced another strong defensive performance as they posted their fourth successive victory on Monday. The Seahawks are on the cusp of securing a wildcard spot in the NFC after holding the visiting Vikings to a touchdown and effectively shutting down two of the team's biggest weapons for most of the game. Minnesota quarterback Kirk Cousins rarely had a chance to get the Vikings passing attack going and when he did, the Seahawks were there. They were so effective Cousins passed for just 27 yards in the first half, his fewest at half-time in a game since the start of his career in 2012, while wide receiver Adam Thielen was not targeted once in the opening half — the first time he was shut down in a single half since 2015. There was not a lot of offense in this game, despite it sporting multiple big play makers including Cousins, Vikings receivers Thielen and Stefon Diggs as well as Russell Wilson. Wilson was held to a career-low 72 passing yards while completing 10 of his 20 attempts. So, when he sprinted down the sideline for the Seahawks' longest run of the season, they needed to overcome a defense that had contained them in the red zone. They did. It was the team's only successful red-zone score and it came at the perfect time. Seattle cemented their lead and followed it up with a fumble recovery for another score. But, the Seahawks were not the only ones who added to the board late. The Vikings also took advantage of a play that, quite frankly, the Seahawks defense gave up on. It was not because of a lack of effort, though, as it seemed Cousins was beyond the line of scrimmage when he completed a touchdown pass to Dalvin Cook in the final two minutes. But, Cousins managed to skilfully keep his foot and ball behind the line and avoided the team's first shutout since 2007. Each team brought their own defensive prowess into this game. For the Vikings, they entered with the best third-down defense and second-best red-zone defense in the NFL. For the Seahawks, their unit boasted one of the best pass defenses at the beginning of the season and have stayed near the top through the stretch. It was Minnesota's task to stop an elusive Wilson, who enjoyed a big home field advantage, and Seattle had to keep a passing attack led by Cousins at bay. Both achieved just that. When the Vikings were on defense, they pressured Wilson when he reached the red zone and held the Seahawks to field goals after two big sacks and then picked off the four-time Pro Bowl player on the one-yard line. Seattle finished one of four in the red zone, and only completed three-of-11 third-down attempts. The biggest concern the Seahawks faced when Minnesota's offense took the field was the pass. The regression in Seattle's own pass defense allowed Carolina Panthers quarterback Cam Newton to complete all 14 of his first-half pass attempts and San Francisco 49ers third-string quarterback Nick Mullens to rack up over 400 passing yards. This time, the Seahawks were up against a play caller with one of the the best receiver duos in the league. But, that did not seem to be a problem. Seattle held Cousins to 208 passing yards, and his top targets, Thielen and Diggs, combined for nine catches. The Seahawks used big plays from middle linebacker Bobby Wagner to stun the Vikings. The four-time Pro Bowl player has led the defense with the departure of some of the team's biggest names. He closed out last week's game with a 98-yard pick-six, and the veteran remained reliable against the Vikings. He finished with nine total tackles and a late blocked field goal that changed the course of the game. There are only six teams that have been eliminated from the postseason and a bulk of them are in the AFC, making the race for the wildcard spots in the NFC tight — to say the least. The fifth-ranked Seahawks (8-5) and the sixth-placed Vikings (6-6-1) held on to those two spots with plenty of other teams in the hunt, including the Panthers (6-7), Philadelphia Eagles (6-7), Washington Redskins (6-7), Green Bay Packers (5-7-1) and Tampa Bay Buccaneers (5-8). It is quite the list. But, the win puts Seattle in a good position with a two-game cushion. Even though their hope of a division championship are out the window with the Los Angeles Rams securing it for the second consecutive season, the Seahawks can still clinch a playoff berth with a victory over the 49ers in week 15. Seattle will close out the season with a tough matchup against the Kansas City Chiefs and a game against the lowly Arizona Cardinals. The Vikings, despite the loss, are also hopefuls for the final playoff spot. Because of the results from week 14, Minnesota have to win at least two of their last three games, which seems possible with contests against the Miami Dolphins and Detroit Lions ahead. The Vikings will also have to face the Chicago Bears.